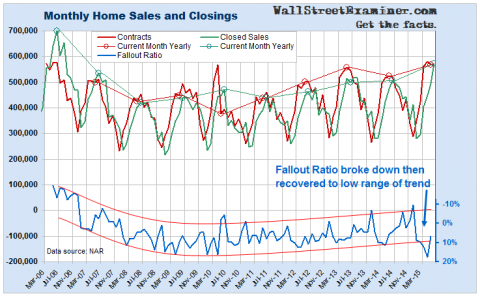 The media dutifully reported the NAR’s version of seasonally adjusted, built-in monthly error times 12, annualized, officially recorded, home sales closings in June today. The housing industry cartel and lobbying behemoth said that houses are selling at an annual rate of 5,340,000 on that basis. What about those statements, true or false? The answer: TRUE! The median sale price was up 6.5% year to year to a new all time high. June officially recorded sale closings totaled 573,000, which exceeded the June 2007 level of 536,000. The problem, as always, was the bullish slant of the mainstream reporting, particularly the Journal’s. The “nominal high” is above the highs at the top of the bubble in 2006. There was no mention of that association in either report. And the sales volume was similar to the volume level just before the market collapsed. No mention of that either. We expect the bullish slant from the Journal because it is the PR arm of Rupert Murdoch’s, Move Inc. According to the WSJ’s standard disclaimer when reporting NAR propaganda, Move Inc. “operates a website and mobile products for the National Association of Realtors.” Oh gee, a website and mobile products–nothing to see here, move along. The disclaimer leaves out a minor detail or two. Move, Inc. actually OPERATES Realtor.com, the NAR’s online listing service for consumers in the housing market, and it operates several other services whose sole purpose is to serve NAR members and customers. Rupert Murdoch is Realtor.com’s Don Corleone, its Godfather! The Wall Street Journal is the actual mouthpiece for the Realtor mob, the massive, monolithic, all powerful cartel that controls the sales of existing homes in the US, and not to mention, is the second highest spending US government lobbying organization, spending $55 million in 2014 to influence Congress, according to OpenSecrets.org. And we’re supposed to take their “news” reporting at face value. Give me a break. While Rupert Murdoch’s News Corp. owns the Journal and Realtor.com and controls the Journal’s propaganda, Bloomberg has no such tie to the NAR. Its reporting is less slanted, but still tilted to only look on the bright side of life when it comes to the NAR data. In neither the WSJ or Bloomberg report today was the word “inflation” used in reference to the big increase in house prices. Neither used the word “bubble” when comparing current levels to those reached at the tail end of the 2002-07 housing bubble of blessed memory. Neither mentioned that the last time sales were this high, the housing market was on the doorstep of total collapse and disintegration. Apparently, such correlations are insignificant to The Wall Street Journal and Bloomberg. Well, we don’t think they’re insignificant. They are facts, and we pay attention to facts. The fact is that when sales are at a cycle record high, at some point most potential buyers who have the ability and willingness to purchase a house, have done so. That’s why there are cycles in the housing business. Given current job market conditions where few jobs are created that provide enough income to make the purchase of a house affordable, the market is probably getting close to the point where most people who can afford to buy have already bought. The inflation of house prices to a record level won’t help that condition. It will only exacerbate it. 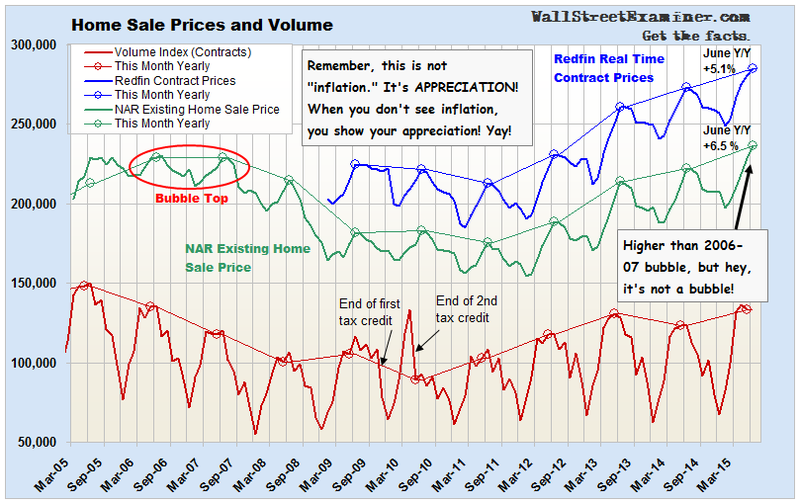 The NAR’s chief economist, Lawrence Yun, actually alluded to that in the NAR press release. 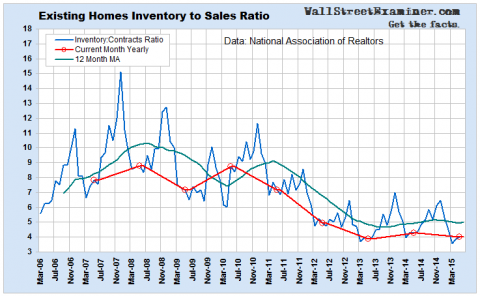 Another fact which the mainstream media glossed over in its NAR PR releases was just how tight supply is. 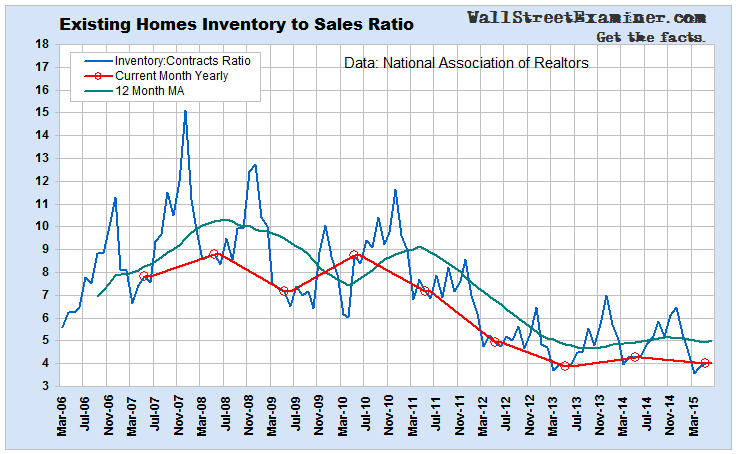 The inventory to sales ratio, based on actual sales contracts signed in May, which will show up in the July “existing home sales” data, is 4.0. Only June 2013 at 3.9 was lower. Tight supply will continue to foster house price inflation. 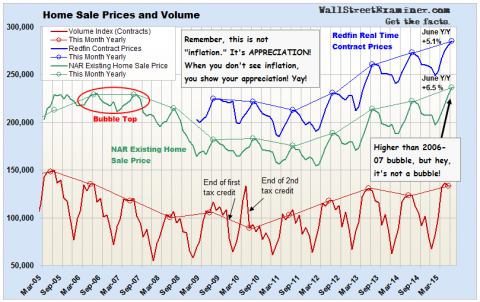 Supply remains artificially suppressed thanks to ZIRP and house price inflation. They encourage aging homeowners to hold on to their “appreciating” asset rather than liquidating and cashing out for income when they buy their Florida or Arizona retirement home. Meanwhile, with mortgage rates stabilizing after rising in the spring, the contract fallout ratio bounced back to within the recently normal range. The spike down occurred as a result of mortgage rates surging earlier this year. Buyers on the edge of qualifying took a hike or were forced to walk the plank. Mortgage rates are tied closely to the 10 year Treasury yield, not to short term money rates like the Fed Funds rate. Contrary to what the Fed wants you to think, it has little control over bond yields. If yields should break out to the upside, another spike in the contract fallout ratio would be a sign that the housing market could be beginning a cyclical downturn from its distorted and already weak fundamental position. As mortgage rates rose, more contracts falling through would be a sign of trouble ahead, suggesting that even fewer buyers would qualify for mortgages.